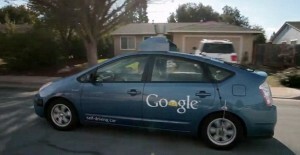 Search engine giant Google gets the license to operate driverless cars in nevada. Google X founder Sebastian Thrun said that the automated driving vehicle project aims “to help prevent road accidents, free up people’s time and to reduce carbon emissions. The cars uses video cameras, radio sensors and a laser range finder to ‘see’ traffic, and use detailed maps to navigate the road ahead. There is no driver required, though one is typically in the front seat ready to take control if need be.Earlier this year Google said that it had completed 200,000 miles of computer aided driving.Nevada issued a special license after the demonstration on different roads.The new plate bears an infinity symbol and letters AU,for autonomous vehicle.Although the vehicles are “test” vehicles for now, the state signaled it intends to be “at the forefront of autonomous vehicle development.” The state DMV Director Bruce Breslow said he felt using the infinity symbol was the best way to represent the ‘car of the future’. Pretty excellent article. When i only stumbled upon your website in addition to needed to say i always have really enjoyed reading your news articles. Anyway I’ll possibly be subscribing on your feed in addition to I hope people write once again soon. I agree with you but It would be nice if you cite your sources next time. I think it’s really important. TY.